All Hail Coffee and Pineapple! 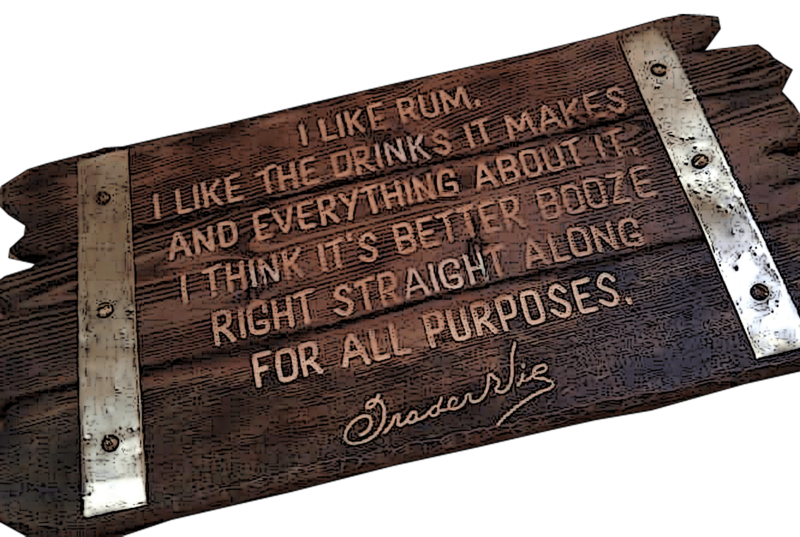 When it comes to coffee flavored tiki drinks, there´s the cold ones and the hot ones, but it´s the cold ones i`m writing about here. Some using cold brewed strong coffee, others coffee liqueur or coffee syrup, or muddled coffee beans in the shaker. I prefer to use either cold brewed coffee or coffee syrup, or a good coffee liqueur. The three types of coffee I prefer to use are Kona coffee, Jamaican Blue Mountian or dark roast Community Coffee from Louisiana. They all have a very lush rounded flavor.. and lots of it! 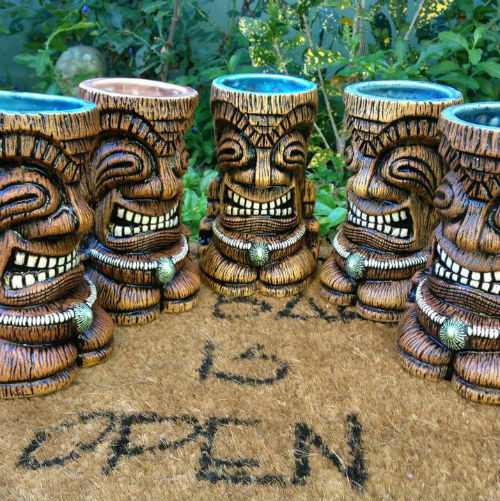 So what I wanna do here is put together what I think are some of the best coffee flavored tiki drinks in one place, plus adding updated versions of 2 of my own drinks. 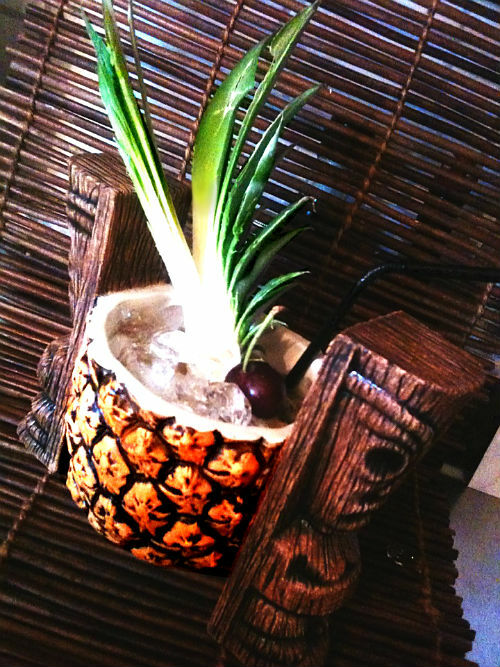 But let´s start with the Atomic Grog´s Tribute to the Mai Kai`s Black Magic…. Labor intensive for sure with all these ingredients, but you will get rewarded! my pro-tip is to make the vanilla and cinnamon syrups, the rich honey mix and Don`s Spices #2 a day ahead, then you don´t need to bother with that when you`re starting to mix the drink. Then start with making the Don`s mix and the coffee (to chill) and the fresh squeezed juices. I don`t have any of the elusive Kohala Bay rum, so I use what`s on hand, for now equal parts of Hamilton Jamaica Pot Still Black and El Dorado 15. Another tip is either Coruba or Blackwell rum, or equal parts El Dorado 12 year old (or 15) and Smith and Cross. This drink is very coffee forward and well blended with the other ingredients. Of course the flavor will vary depending of which coffee is used, I used New Orleans Community Coffee, Dark Roast, which is very full flavored and strong coffee. Blend with up to 1 1/2 cups of crushed ice in a top-down mixer for around 5 seconds, or until frothy. Pour into a large snifter glass with more crushed ice to fill. 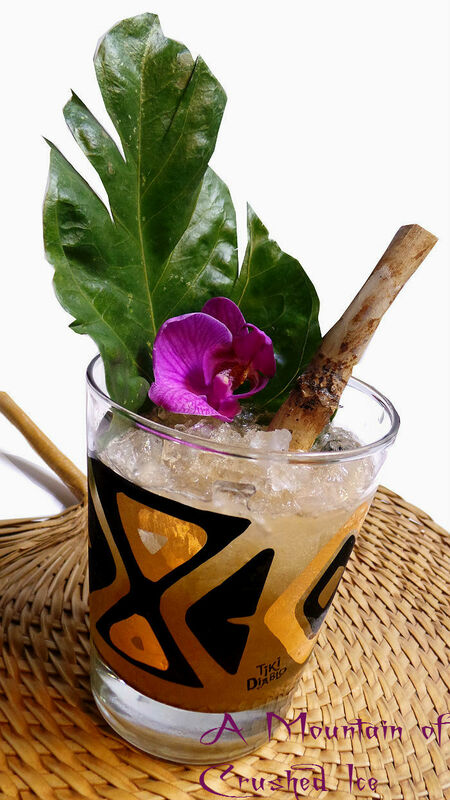 This recipe was based heavily on Atomic Grog´s Black Magic tribute, adding a few elements of the rum barrel. 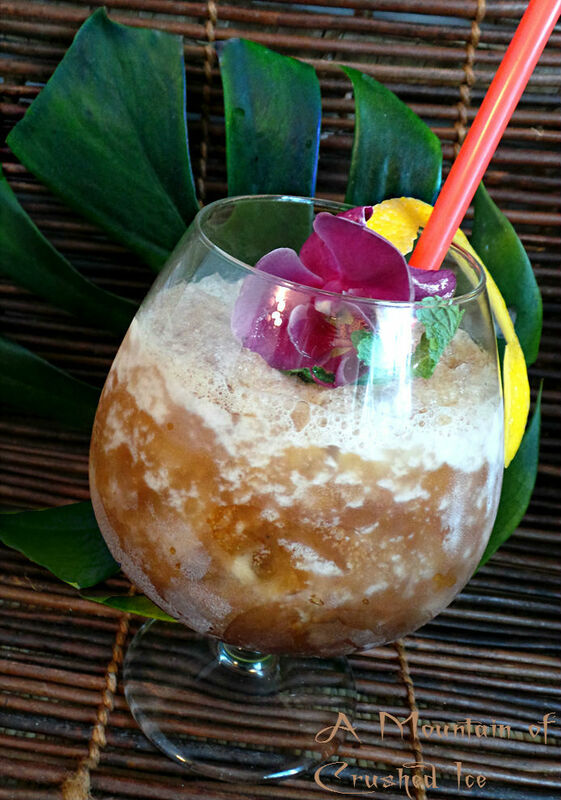 Same rum substitution for Kohala Bay as with the Black Magic Tribute. This one is a bit lighter since there´s a light rum instead of two dark, and equally coffee flavored but less of Don`s mix and no spices #2 but instead an element of passionfruit is added as well as 2 drops of Herbsaint, adding that subtle lace of anise – something Donn Beach often used among his arsenal of secret weapons. 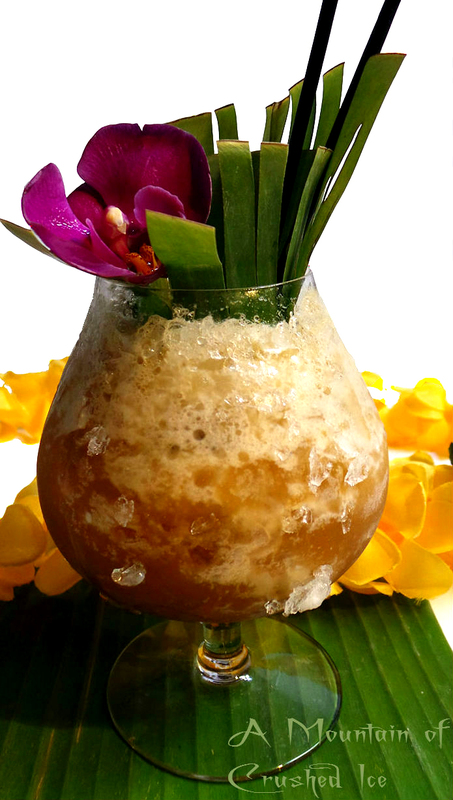 But the drink got it´s name because of the connection of nutmeg syrup and the Banda islands in Indonesia which are seven volcanic tropical islands which have an interesting but sad history. The Bandanese had long used nutmeg as a currency, which they traded for food with people from other islands. Blend in blender (or preferable a top-down mixer) at high speed for 5 sec and pour into a snifter, add more crushed ice if needed and garnish, finish with a little grated nutmeg on top. Blend all ingredients except the coffee in blender at high speed for up to 10 sec and pour unstrained into a 36 oz snifter filled with ice cubes, float coffee. 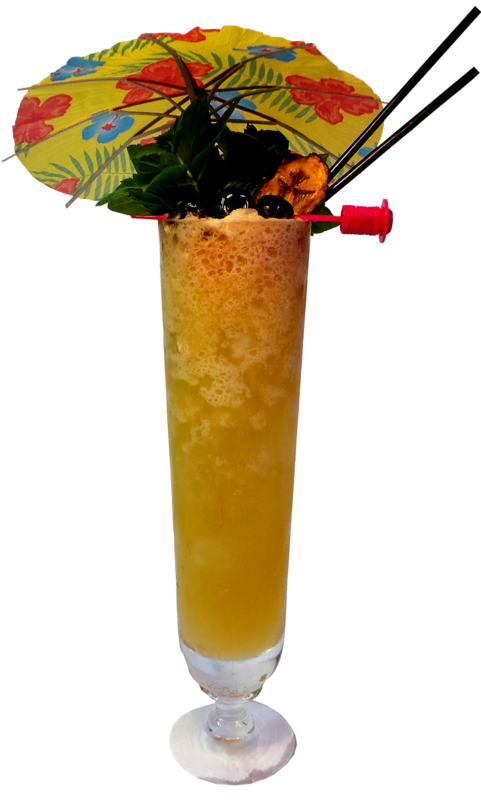 And after the powerful Krakatoa – here´s my tribute recipe to one of my favorite drinks ( they are a few….) at the Latitude 29 – the Espresso Bongo! not that I have the recipe for it…I can only make a guess the proportions – but on the menu it says “Gold Jamaican rum bestirred by pineapple, coffee syrup, passionfruit, orange and lime” My guess is that the gold Jamaican rum is Appleton VX…I didn`t have it, so instead I used Appleton Extra and Coruba. Then the orange might be orange juice… but I instead decided to use the fabulous Brazilian Zulu bitters which i wrote about a while ago, the Zulu orange bitters which has a very vibrant flavor. They contain exotic local ingredients from the rainforest. But to sub with I recommend Angostura orange which does just as well. Add all ingredients and 8oz of ice into blender. Blend by 5 one second pulses. Pour into double rocks glass. 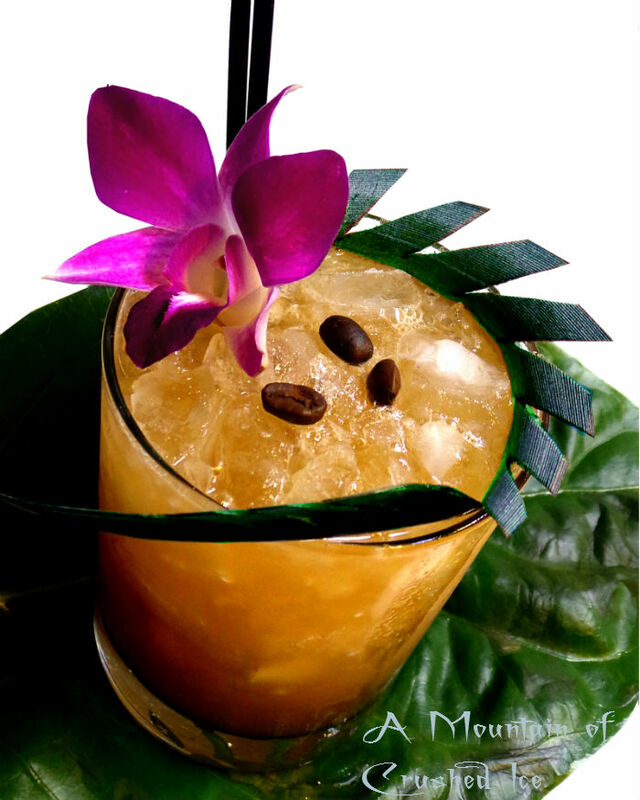 Garnish with a pineapple leaf cut like a palmfrond….and 3 coffee beans! 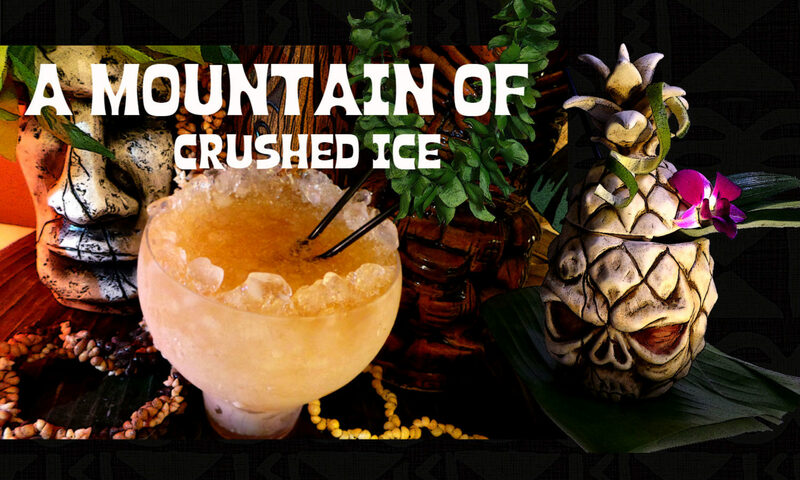 And then we have this, apparently me and Craig Hermann aka Colonel Tiki have made one Dark Magic each that are totally different 🙂 his version is the oldest and I wonder if this is the recipe that inspired the Espresso Bongo? or is the Black Magic? Add all and 8oz of ice into blender. Blend by 5 one second pulses. Pour into double rocks glass. Garnish with maraschino cherry and lime wheel. With compliments to Jeff “Beachbum’ Berry and The Mai-Kai’s Black Magic. 1.5 cups crushed ice, blended at high speed 5 sec and poured in snifter filled with more crushed ice. 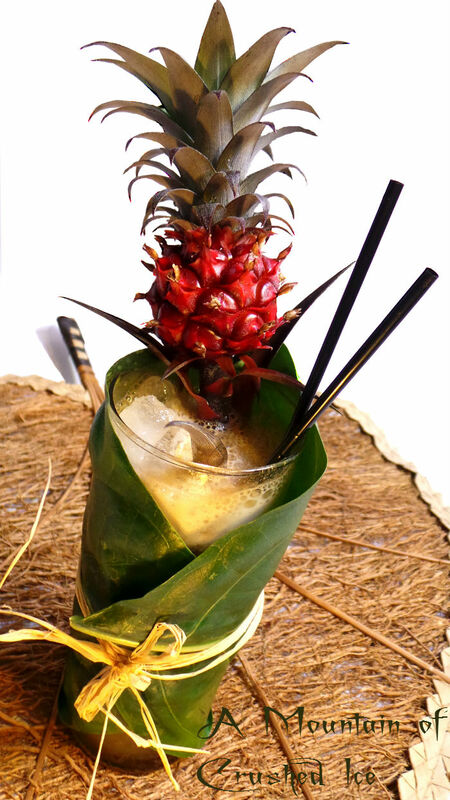 Garnish with pineapple leaf and tropical orchid. 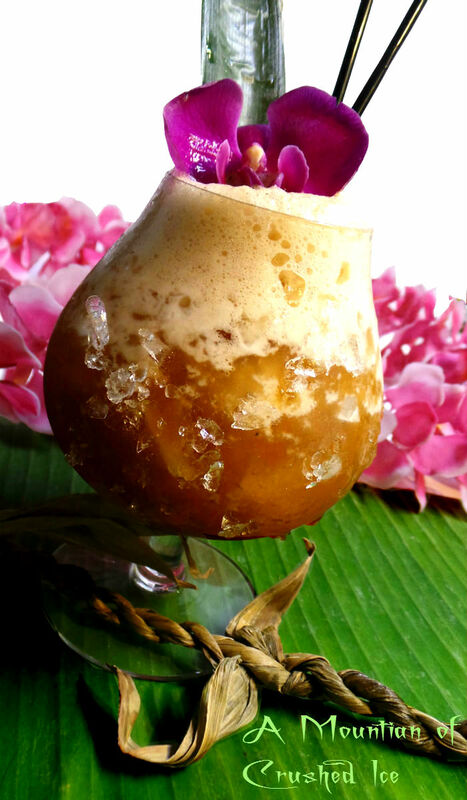 Coffee and grapefruit sweetened with homemade banana syrup and made strong with potent rum! To make banana syrup* – either make a 1:1 simple syrup with dark sugar or use one readymade if you have, slice one ripe banana and with a fork mash it a bit in the pan. Then heat up to a slight boil, let boil for 10 sec while stirring and then take off heat and leave to sit for an hour, then strain and bottle. 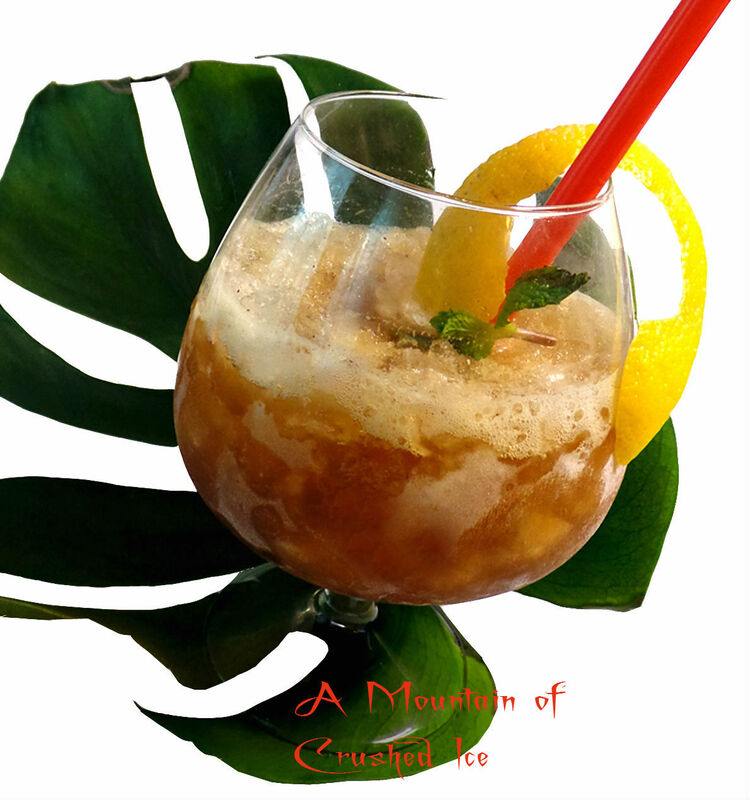 And then….I found this recipe on Atomic Grog, the Pain Reliever, a drink made by Brian Miller. 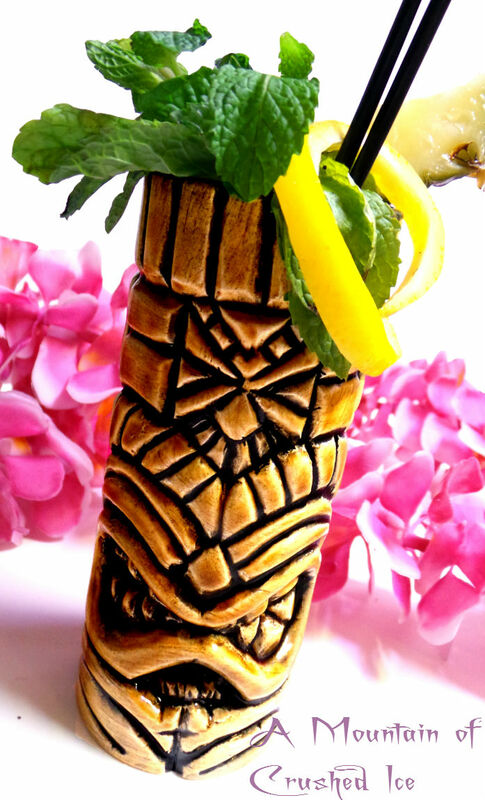 Pulse blend with 1 cup of crushed ice for 6-8 seconds, then pour into a Tiki mug – in this picture is a mug from Wild Thing Creations. 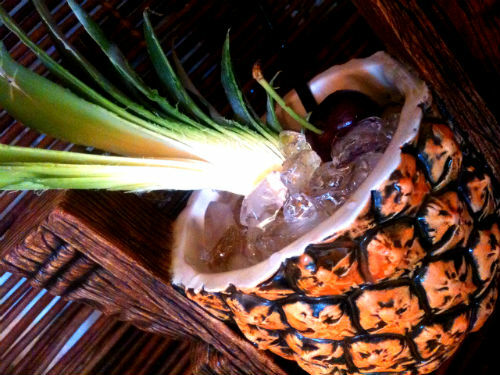 Garnish with a pineapple wedge and grated coffee bean. 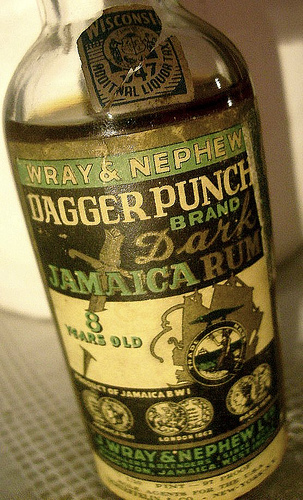 I don`t have any Zacapa or Myer`s, so I used Jamaican and Demerara rums, works just fine! or even better…Also note that coconut cream is not the same thing as “cream of coconut” (Lopez and Real) it´s the top part in the cans of coconut milk which is thick and creamy, (in most cans anyway) there´s also cans of just coconut cream. It´s also possible to make your own. 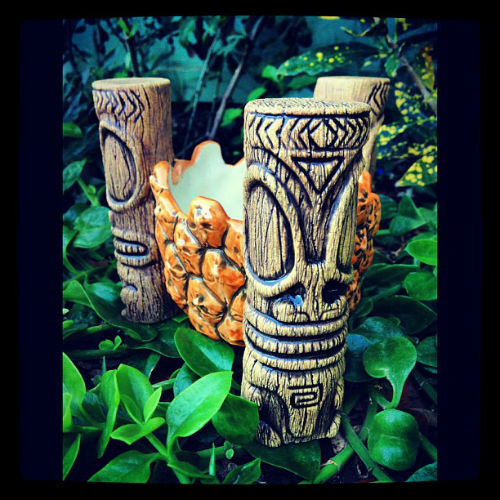 Now that was my last post for this tiki month! 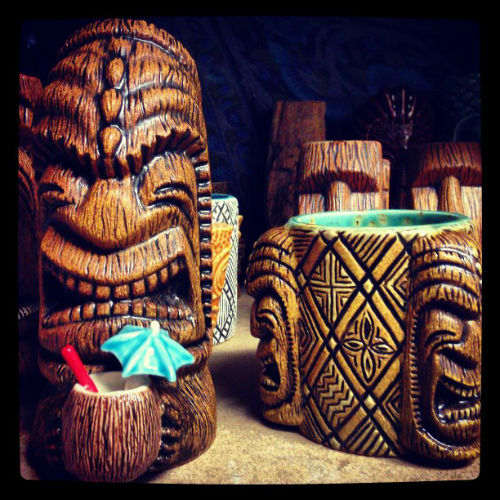 but like I said every month is tiki month for me so no changes here…. 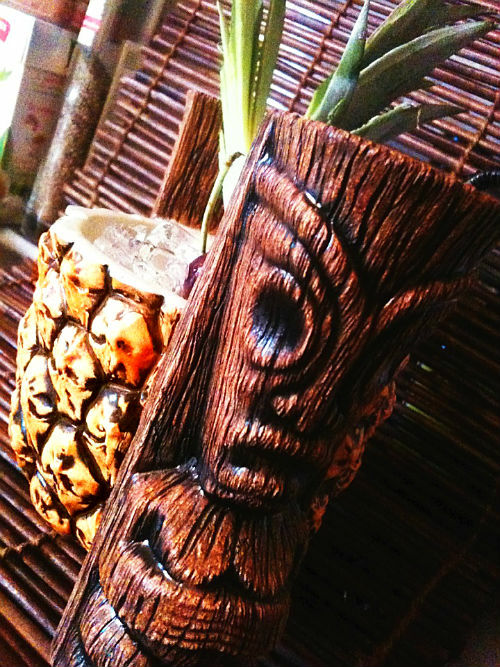 Thanks for reading, I hope you will find some inspiration to make a few tiki coffee drinks!